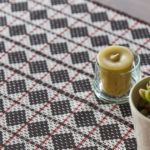 This year marks my eighth at Handwoven, and in that time I’ve written dozens of articles for the magazine and hundreds of blogs for the website. I’ve worked as lead editor on 2 issues of Easy Weaving with Little Looms and the eBook for Zoo Crew. And yet, to paraphrase the immortal Shel Silverstein, as sung by Dr. Hook and the Medicine Show (affiliate link), “The thrill I’ve never known is the thrill that’ll gitcha when you get your picture on the cover of the Hand-wo-ven.” Well, at least until the March/April 2019 issue comes out. Somehow, my Ancient Rose overshot scarf made it to the cover. And to be honest, a small part of me is still in shock. The cover project in question might look familiar to those who’ve read my blogs this past year: It’s based on my Poppy-Inspired Scarf, this time with a commercially available weft yarn. Seeing this particular project on the cover is especially sweet because this overshot scarf means so much to me on a personal level. This is the project that brought me back to weaving. Pregnancy and early motherhood took a lot from me, physically and emotionally: my energy, my time, and my ability to view myself as, well, a “self” beyond Mom/Wife/Editor. When you view yourself only in everything you have to do for other people, it’s hard to find the time for things you want to do. And so I let my loom gather dust as I changed diapers, made dinners, and met deadlines. 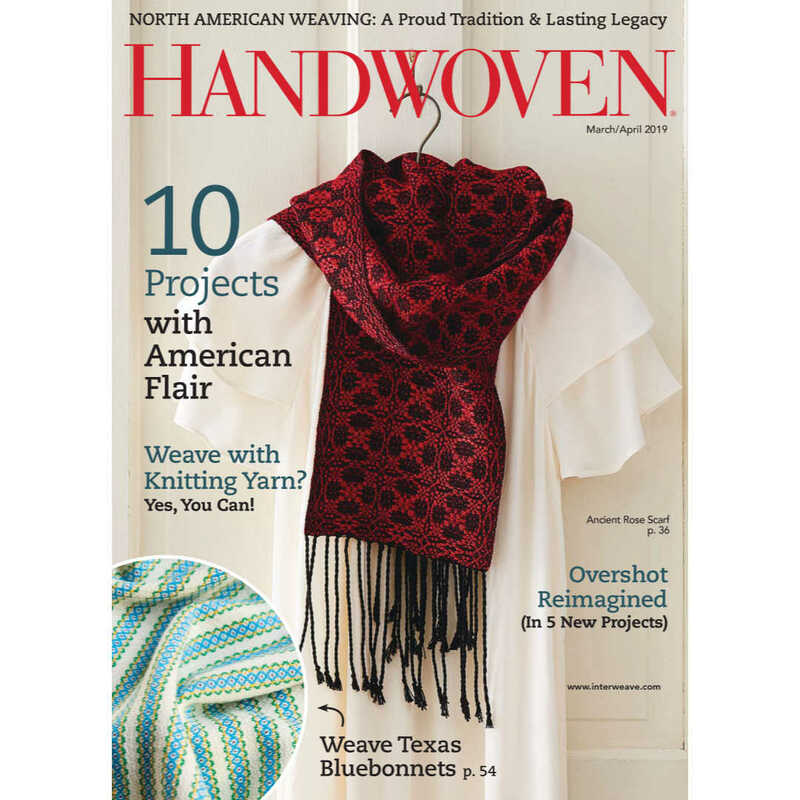 Christina’s scarf on the cover of the March/April 2019 issue of Handwoven. Weaving the original Ancient Rose overshot scarf was my way of reclaiming who I was as a person and a weaver. With every thread I wound and warped and with every pick I wove, I told myself that I was valuable as a person. Taking the time to weave was a reminder that taking care of me was just as important as taking care of everything and everyone else in my life. This project also reminded me why I love weaving so much. Weaving this particular overshot scarf required constant vigilance as I handled 2 shuttles and tricky selvedges. This diligence allowed me to experience the joy that can only come from getting completely lost in the process of weaving. Time stood still as I threw my shuttles and watched the pattern magically appear with each pick. When the scarf was finally finished, it was everything I had wanted and had hoped for. The Tencel softened up beautifully after wet-finishing, and the red yarn practically glowed in contrast to the black background. Best of all, this project made me want to weave more. Now that the Ancient Rose Scarf is on the cover of the March/April 2019 issue, it will serve as a reminder: Every time I pull a copy out for reference or see the issue on our website, I’ll remember what it was like to feel so overwhelmed by life that I forgot who I was as an individual, and then I will remember what it was like to rediscover myself and the things I love. I will also remember that it’s never too late to come back to weaving and that no matter what life throws at me, I will always, in my heart of hearts, be a weaver. 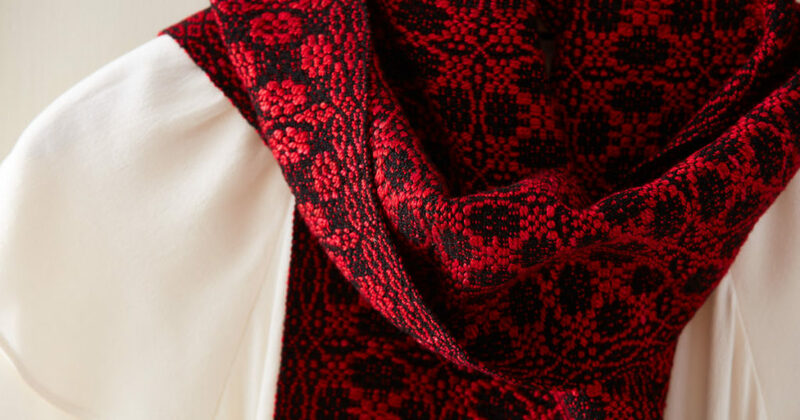 Featured Image: Closeup of Christina’s Ancient Rose overshot scarf. PHOTOS BY GEORGE BOE.